Few names carry as much emotional and physical weight as the iconic Italian brand name. It is a name that today carries prestigious recognition from enthusiasts and normal folks the world over. That kind of credibility does not come easy in any business, especially cars however Ferrari has proven its mettle time and time again. Ask almost any automotive journalist to rank the best sports cars ever made and the ultra-fast, and equally exclusive, Ferrari F40 will easily make the cut. On auction blocks, the sensually curvaceous 1962 Ferrari 250 GTO is the highest auctioned car to date. In between the two Ferrari released the Testarossa, a car so perfect for its time, and so exclusively accessible, that it unequivocally ushered them to world star status. It may be well known that the Italian automobile manufacturer was started as a way to fund the motorsport exploits of its founder Enzo Anselmo Ferrari. So logically, all of Ferrari’s cars can be stemmed back to racing cars with a fire-breathing attitudes. Nevertheless, Ferrari’s also saw the opportunity to their use their brand to sell more cars throughout the world as a way to support their sport. This is how Italian panache, racing pedigree, and the cocaine-addled 80’s all mixed together to produce what we know as the Testarossa. 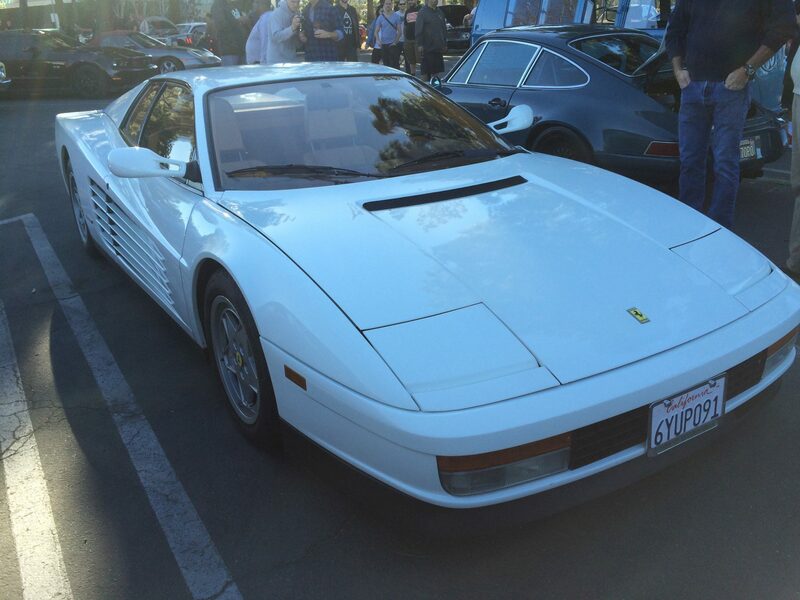 Ferrari’s design for the Testarossa would be for it to become their first ‘world car’. This meant the car would have to be marketable and perform for a diverse customer base in many different countries. The base design started from the car it would be replacing, the 512 BBi. The previous car had run its path and its antiquated technology, was now, well dated. 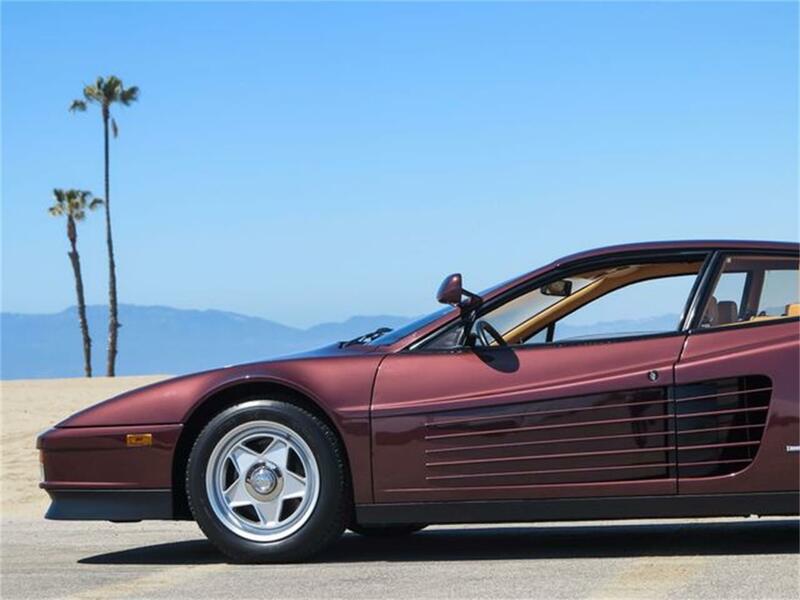 Carried over was a flat 12 mid-engine design, but the Testarossa displayed notably different external body styling and considerable changes to its internal bits. 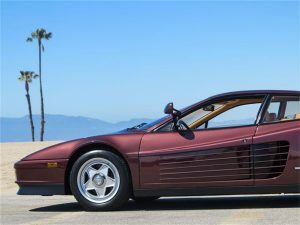 What initially draws you to the Testarossa is how aesthetically pleasing, and unique, the exterior is. A rounded front bumper was a radical departure from the hard-edge wedged shape of Ferrari’s previous models. High sweeping rear haunches were integrated with the doors to make a continuous line from mid to stern and the thin, louvered side intakes were unlike anything ever seen. However, there were detractors. Labeled by some to be “cheese graters”, these louvered intakes were, in fact, valuable to the high-performance aerodynamics of the car. These intakes efficiently cycled in fast moving air through the large radiators on either side and forced high-pressure air out through the top of the engine cover. This improved the aerodynamics of the car by keeping the car planted at speed without a large rear spoiler. The rest of the bodywork continued as the anthesis of catatonic design. The bow featured large pop-up headlamps, a small lower grill flanked by a multitude of lights, and full-length front splitter. The distinctive styling of the front was carried over to the rear with a five-slatted grill holding four multi-colored tail lights and below four brightly polished exhaust tips down pushed out the sonorous bellows of the flat 12. The exterior still stands as one of the most innovative and provocative designs to come out of Maranello. 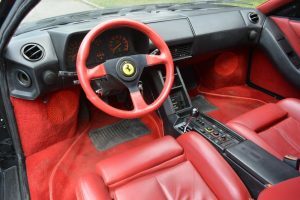 Inside the cockpit, Ferrari ditched the race inspired, minimalist dashboards from past decades and went for a contemporary comfort and ergonomic design. The center console complimented the sweeping design from the exterior; only the air vents interrupted the look at the top of the console. The seats were sporty but supportive and were wrapped in only the finest Italian cow hides, so as to be softer than previous generations. This was another “world car” decision that would draw some complaint from the more race focused Ferrari owners. Under the rear hatch, a combination of aluminum and steel made up a true treat of an engine – 12 cylinders all aligned to tingle the senses. The engine was 4.9L of displacement but thanks to some marketing department math, it was sold as 5.0L. Other goodies in the engine compartment tick off some marks on the sports car checklist. Four valves per cylinder, dry sump lubrication, and 9.2:1 compression. All of those attributes, and more, amounted to 390 horses with 361 ft lbs of torque with one hell of a staccato. 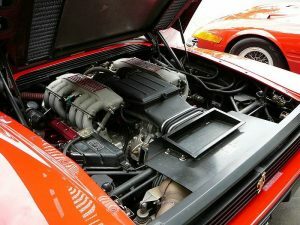 A Testarossa engine with red cam covers. 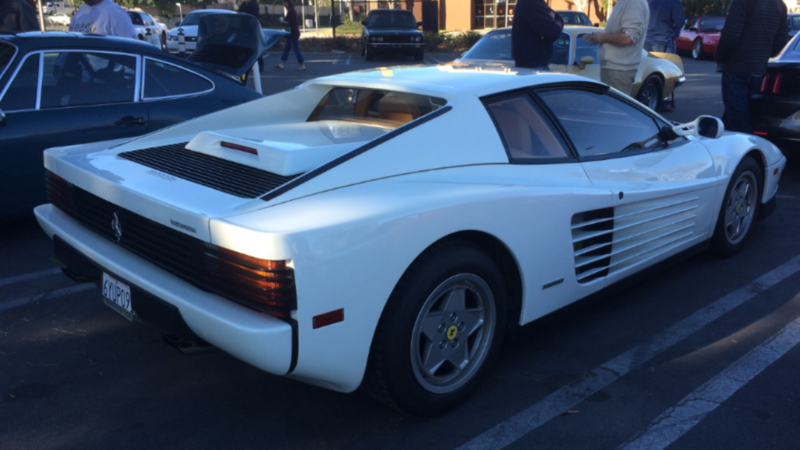 The world car idea meant small, and even major, changes were incorporated into the engineering of the Testarossa. For example, To be sold to the U.S. millionaires that lusted after the latest and greatest from Maranello, the Testarossa had to meet those emissions standards. While the engine did evoke the right emotions for U.S. Buyers, it did not meet CO2 regulations. The engineers responded with drastic changes to the engine to ensure its certification. Coupled with a Bosch K-Jetronic fuel injection system with Marelli Multiplex Ignition and the addition of catalytic converters the car was finally authorized for sale on U.S. shores, while still sporting 375 hp. The world car design approach paid off so well for Ferrari to the tune of 7,177 cars sold globally. Good numbers for a small manufacturer. This realization marked a turning point for their perception as an automotive manufacturer for how to ensure profitability and funding for their racing teams. 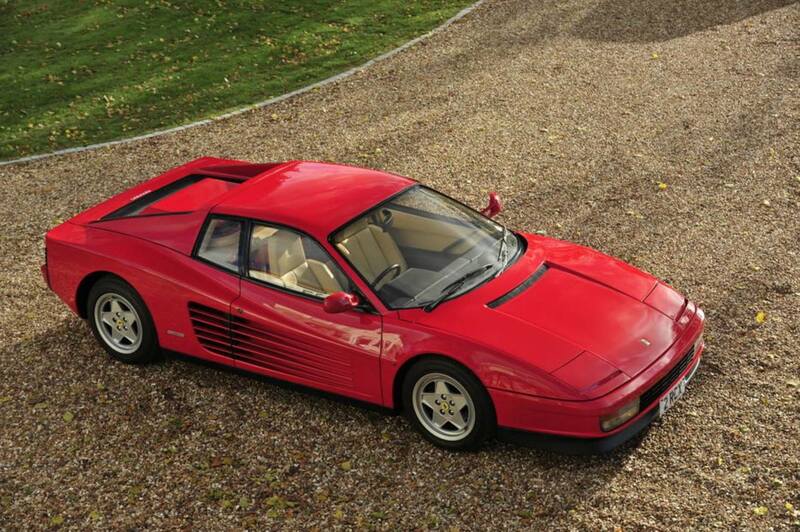 Reading a description on the Testarossa unveiling reveals exactly how the car became the zeitgeist of the 1980’s. In a space outside the Lido nightclub in Paris, an elevated platform the size of a small battleship was used for the unveiling of the new Ferrari sports car. After a dazzling display of fireworks, lasers, and lights the platform descended under complete darkness – a single spotlight illuminated the new car. This awe-inspiring presentation caused such a stir in the audience that 37 orders were placed that night. It would be impossible to consider the 1980’s sports car greats and not think of the Testarossa because it was so svelt, so trendy. A-list celebrities flocked to the car. Big names like Elton John, Michael Jordan, and Rod Stewart all owned them. 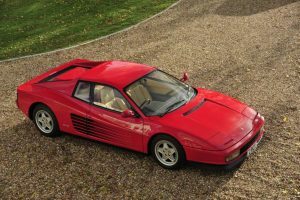 Jack Nerad, Executive Director of Editorials at KBB, explained the Testarossa’s appeal as a “…car designed and built to cash in on an image. And since cashing in was what the Eighties were all about, it was the perfect vehicle for its time.” In truth the only car with an image as iconically 80’s as the Testarossa is the Delorean DMC-12. However, where the DMC-12 is like the quirky computer nerd the Testarossa is the popular prom-queen that cashes in for looks.